Nd:YAG laser vitreolysis has been used as a noninvasive approach to treat visually significant vitreous strands and floaters. However, severe vision-threatening complications may occur. The authors describe a rare case of a 60-year-old woman who had suffered rupture of the posterior lens capsule with subsequent cataract formation 1 week post-Nd:YAG laser vitreolysis in the right eye. The authors performed phacoemulsification, pars plana vitrectomy, and intraocular lens implantation at the ciliary sulcus. 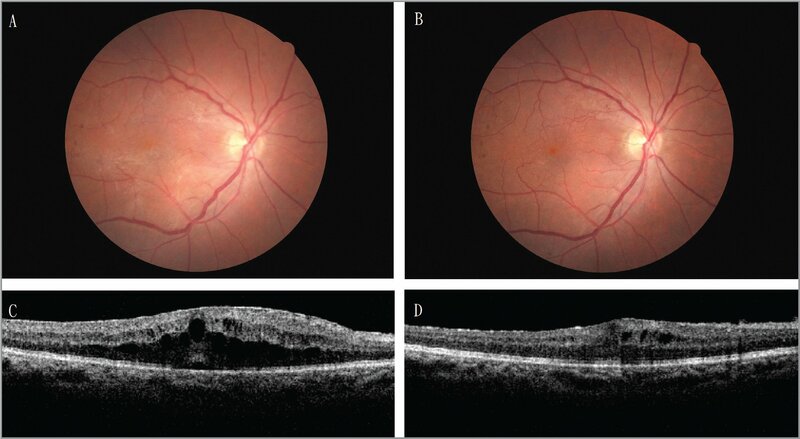 At 1 month post-surgery, the patient's visual acuity had not recovered well and optical coherence tomography showed epiretinal membrane (ERM) formation. Thus, she underwent secondary pars plana vitrectomy for ERM removal. Nd:YAG laser was developed to treat posterior capsule opacities after cataract surgery.1 Its photo-disruptive laser intervention is also used for vitreolysis in patients with vitreous floaters.2–4 Despite being a relatively noninvasive treatment for significant vitreous opacities, as compared to pars plana vitrectomy (PPV), it may induce complications associated with retinal injury and crystalline lens damage. We here present a rare case of a patient who suffered a series of complications after Nd:YAG laser vitreolysis. A 60-year-old female patient was referred to our clinic for visual impairment in the right eye 1 week after undergoing Q-switched Nd:YAG laser vitreolysis for symptomatic floaters in the anterior vitreous (Figure 1). According to the referring doctor, her visual acuity (VA) was 6/6 and she had no cataract before laser vitreolysis. The laser parameters were as follows: wavelength, 1,064 nm; spot size, 8 μm; pulse energy, 4 mJ; three bursts, with single pulse per burst. The patient denied any other surgery, trauma history, and other pre-existing diseases, such as refractive error, diabetes mellitus, hypertension, or infectious disease. In our clinic, her best-corrected VA (BCVA) was counting fingers at a distance of 30 centimeters in the right eye and 6/7.5 in the left eye. Slit-lamp examination revealed a punched-out lesion with spreading linear rupture of the posterior capsule as well as cataract formation in the right eye (Figure 2). External photography in the right eye before YAG laser vitreolysis. (A) Opacities in the anterior vitreous (arrow). (B) Schematic drawing of anterior vitreous opacities (arrow) according to records from the referring doctor. External photography and retro-illumination image of the right eye at the initial visit. (A) The punched-out cataract (arrow). (B) The tear in the posterior capsule (arrowhead) and cataract (arrow). 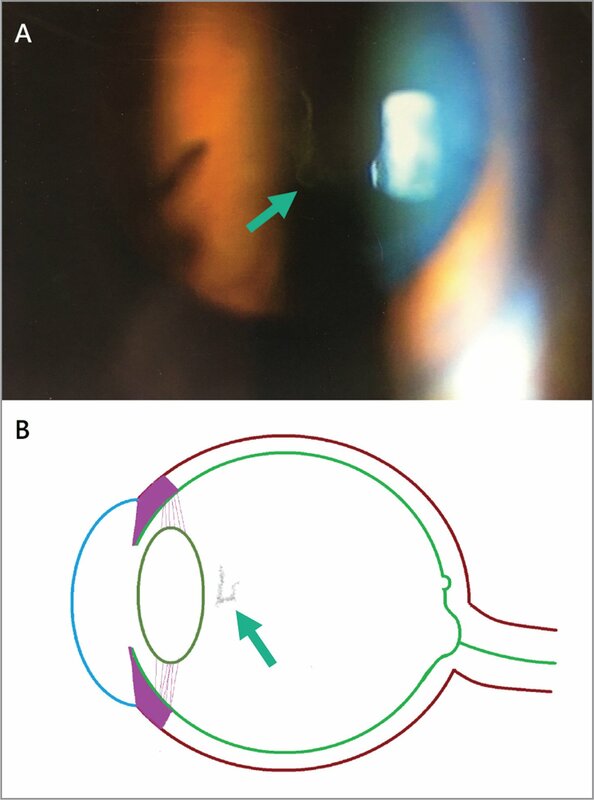 The patient underwent phacoemulsification for the traumatic cataract, during which the disrupted posterior capsule and a portion of lens cortex dropped into the vitreous, as anticipated. PPV was performed to remove this lens material, and an intraocular lens was implanted at the ciliary sulcus. No obvious retinal injuries, such as epiretinal membrane (ERM) or focal trauma caused by laser irradiance, were noted during surgery. At 1 month post-procedure, the patient's VA remained 6/60 in the right eye and ERM formation was noted (Figure 3A). Optical coherence tomography (OCT)-measured central macular thickness (CMT) of the right eye was 616 µm (Figure 3C). Thus, secondary PPV with ERM peeling was performed. Post-surgery, the ERM was improved (Figure 3B). One month after secondary PPV, her BCVA could be corrected to 6/20 and the CMT was measured as 411 µm (Figure 3D). This patient developed iatrogenic cataract after undergoing Nd:YAG laser vitreolysis for significant anterior vitreous floaters. Post-PPV ERM resulted in persistent poor vision and additional pars plana vitrectomy was required for ERM removal. The efficacy and safety of using an Nd:YAG laser to treat vitreous opacities depends on the clinician's experience as well as other variables. The recommended distance from the focal plane of the photodisruptor beam to the adjacent tissue is at least 5 mm anterior to the retina or posterior to the crystalline lens.2 Bonner et al.6 reported that a YAG laser with 2- to 6-mJ pulse energies could lyse rabbit vitreal membranes safely when the focus area was 2 mm from the retina, but that the distance should be increased when using greater pulse energy, to prevent substantial retinal damage. Other coexisting factors, such as vitreous haze and irregular optical surfaces, could cause scattering of the laser and unnecessary retinal irradiance, increasing retinal damage.2,5 Thus, careful patient selection is needed before performing the laser vitreolysis procedure. ERM is a disorder of the inner retinal surface, characterized by decreased visual acuity and metamorphopsia; it is common amongst older patients.7 Any process causing retinal injury may induce ERM formation.8–13 ERM may represent a reactive gliosis in response to retinal injury or a disease involving inflammatory and glial cells.14 In our case, the Nd:YAG laser vitreolysis, disrupted lens cortex, and intraocular surgery were all risk factors for ERM formation. Availability of macular OCT images acquired before and after Nd:YAG laser vitreolysis would have allowed comparison, but macular OCT was not performed by the referring doctor prior to the procedure. As VA before laser vitreolysis was 6/6, any ERM that may have been present was not visually significant. In conclusion, Nd:YAG laser vitreolysis has the potential to cause disastrous complications, even though it could be an option for treating visually significant vitreous strands and floaters. Nevertheless, these side effects should be kept in mind, and the procedure should be performed with great caution, particularly in young and phakic patient groups. Benichou C, Flament J. [Epiretinal membrane and photocoagulation with argon laser. Discussion of 3 cases]. Bull Soc Ophtalmol Fr. 1989;89(4):613–619. Uemura A, Ideta H, Nagasaki H, Morita H, Ito K. Macular pucker after retinal detachment surgery. Ophthalmic Surg. 1992;23(2):116–119. Hanczyc P, Wozny J, Popiela G. [Macular pucker after surgery for retinal detachment]. Klin Oczna. 1991;93(7–8):221–223. From the Department of Ophthalmology, Tri-Service General Hospital, National Defense Medical Center, Taipei, Taiwan, Republic of China (K-HH, T-HW, Y-JC, Y-HC); and the Department of Ophthalmology, Songshan Branch of Tri-Service General Hospital, National Defense Medical Center, Taipei, Taiwan, Republic of China (K-HH). Address correspondence to Yun-Hsiang Chang, MD, Department of Ophthalmology, Tri-Service General Hospital, National Defense Medical Center, No. 325, Sec. 2, Cheng Gong Rd, Nei-Hu District, Taipei 114, Taiwan, Republic of China; email: yun.siang@me.com.